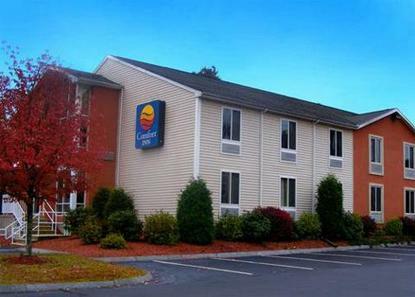 The Comfort Inn is located in southern New Hampshire Merrimack Valley and is under new management. Complimentary Comfort Sunshine Breakfast with hot items. A great value for everyone in the family. A visit to tax-free New Hampshire offers great shopping, and other entertainment. The Anheuser Busch Brewery is just down the street, museums, shopping, dinning and other entertainment abound in nearby Nahsua or Manchester. Special event NASCAR racing at Loudon is one hour away. Whether you are coming for NASCAR, Bike Week, shopping, or vacation, this hotel offers a great location. Free airport shuttle service. Free corporate shuttle service within two miles of hotel.